Whenever it’s raining I just want to stay indoors, cuddle up with my cat, and eat comfort food. This super easy (and healthy!) 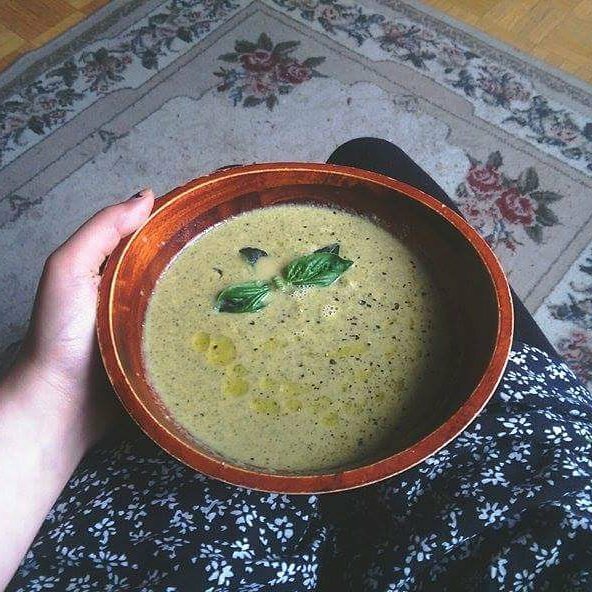 broccoli soup feels like a big hug from mother nature. Almost every ingredient is a pantry staple, so I didn’t even have to make a trip to the grocery store to make it. It’s packed with B12, iron and protein, and takes less than 30 minutes to make! In a large pot, sauté 2 diced shallots and 3 minced garlic cloves on medium heat in coconut oil until fragrant. Add salt, pepper, and dijon. Sauté for an additional few minutes until flavours are incorporated. Add broth. Let simmer on low heat for 5 minutes. Add almond milk and broccoli. Cover and cook for about 15 minutes or until broccoli is tender. Add remaining shallots and minced garlic. Let simmer for five minutes. Remove from heat. Stir in nutritional yeast and lemon juice.